Red Sea Dive Center in South Beach, Aqaba, offers free Turkish breakfast that includes pita bread, cucumbers, olives, tomatoes, hummus, pineapple juice, bread (butter & jam as well) and tea/coffee. The staff is very friendly and helpful. That was a great and filling breakfast, keeping us up and running for the adventurous morning that we were about to have. They also offer scuba diving for JOD 40 per person, per dive. We were asked to gather at their dressing room at 9am, where they select the right sized suit and shoes. Abdullah, our guide and hotel staff, was helpful and patient with all the tantrums of the 10-odd number of people waiting to get their gear on. After making sure we had all the gear, we were packed into a mini-van and taken off to the Japanese Gardens, which is a coral reef in the Red Sea, about 10 minute ride from the resort. Upon reaching the shore, we were given instructions and asked to put on the gear – diving suit, gas tank, diving glasses and fin-shoes. Weights were attached to a belt and wrapped around the waist that makes us sink in the salty sea. Walking from the “changing area” on the shore to the sea was on scorching hot pebbled-sand and very uncomfortable! 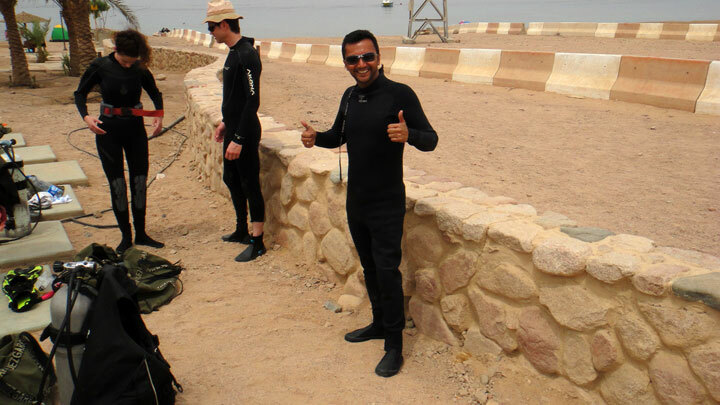 For scuba diving with any of the resorts in Aqaba, don’t expect professional and perfect gear. Make sure the fins-shoes are a size smaller than what is recommended, which will make them really tight on your feet and help keep them on while diving. The ones I had on were exact size and the lock was off when in water that made the fins loose and impossible to swim. When we were in waist-deep water, our instructors, Abdullah and Saki, helped us put on the fins; and we started with our first dive in shallow waters, making sure we were easy with the gear on. After a few glitches – water filling up in glasses, pressure differences on ears and being unable to breath, we got comfortable and headed out in the open sea. It was all good and magnificent since then – the coral reefs, fishes, turtles, sea-horses and sea urchins. My very first dive and now I cannot wait to dive in the Great Barrier Reef in Australia! The whole 40 minutes of under water was an experience I’ll always remember. On our way out, the mini-van was waiting for a ride back to the resort. A quick shower later we were on our way to the Aqaba city center. The taxi costs JOD 5 (per ride) one way and takes about 15 minutes to reach the Aqaba Fort at King Hussein street. 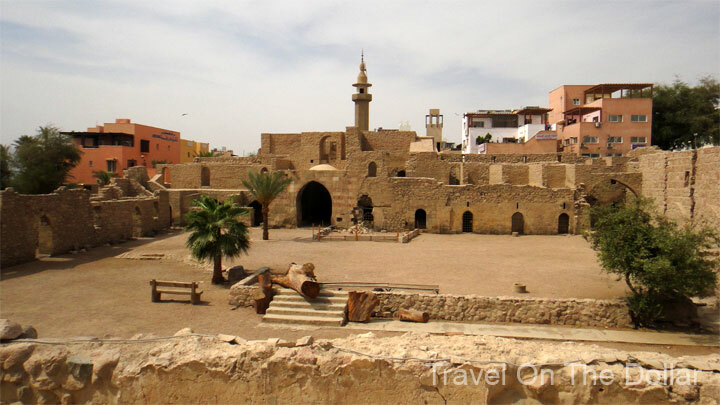 There’s not much to do and see in Aqaba except for a few sites that travel guides recommend, one of which is the Aqaba fort. You pay JOD 1 as entrance fee and there’s a free museum you can visit. But it’s not worth spending the time and money on this place since it’s not at all preserved well, the whole place smells of urine and trash and the only residents you’ll find are cats and rats. Spending about 20 minutes at this terrible place, we walked past the fifth tallest free standing flagpole in the world at a height of 130 meters (430 ft) and hosts the flag of Arabia, indicating the start of the Arabic nations for the cruise ships entering the Red Sea into Jordan or Israel. 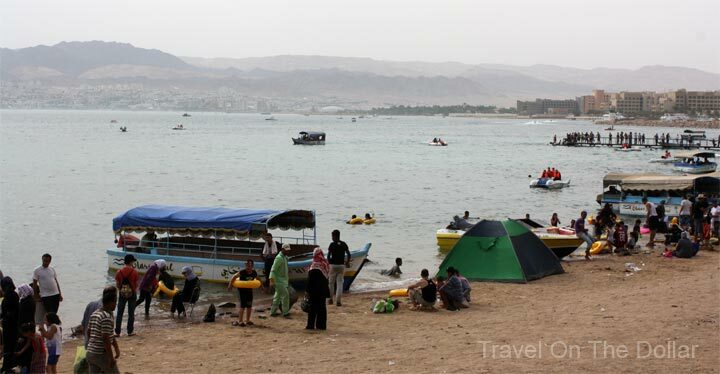 Walking along side the beach-side on King Hussein street, we headed towards Alayah (Alya) Square in search of ‘Hani Ali’ – supposedly the best place for sweets in Aqaba. Turning right on Hamamat Street, we walked past the right turn on Raghadan street and walked ahead. 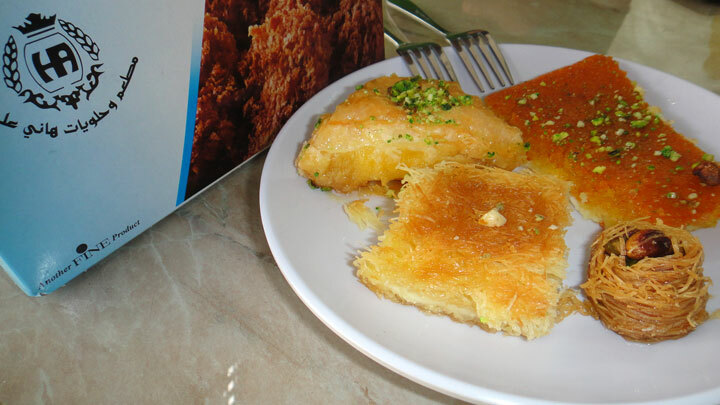 After asking some locals, we got to know that Hani Ali sweets is on Raghadan street (Address: 3 Raghadan St., Aqaba). It’s a big restaurant/store that offers about 50 varieties of sweets and for oriental cake lovers, this is paradise. Try the baklava and dough thin-shell pistachios, hazelnuts, pine nuts with a touch of sugar or honey. Reasonable prices and the baklavas are a must-bring-back-to-home item. Walked back to the beach via Alayah Square, and being Friday the beach was packed with locals, camping out at the shoreline. Families had setup tents right at the shore with half tents in the water and other half on the sand. This seemed to be a popular way of dipping feet in the water, while sitting on a chair, avoiding the Sun directly on them. A bunch of fishermen boats will offer glass-bottom rides in to the Red Sea, but it’s not recommended to hire them as the water in the Red Sea is not clear enough to see the corals or fishes from the glass-bottom boats. A stroll at the beach and a quick walk on the pier after, we went looking for a shack that serves some Jordanian food and hookah, and landed at this restaurant with a roof-top seating area. The views of the sunset were spectacular from the roof-top and you can see Eilat (Israel) and Taba (Egypt) across the Red Sea. After sun down, we started to head back to King Hussein street, but heard some people having a party on the street-side, and walking over to the flag-pole square, there was a bunch of guys singing, dancing and playing musical instruments. It was a great experience to watch them have a fun time and be a part of the ‘event’. Got a taxi back to the hostel and called it an early night, looking forward to two days in Petra.